The news that Major General Levi Karuhanga, the chairman of Museveni’s Kangaroo Court, the so-called General Court Martial, is unwell and is admitted in hospital, cannot become reason for Museveni and his terrorist bunch to keep General David Sejusa behind bars in Luzira prison. As far as Free Uganda is aware, the High Court of Uganda ordered the so-called General Court Martial to cease hearing the Sejusa case. Museveni and Levi Karuhanga were forced to officially abandon the case, and this was formally communicated by Levi Karuhanga at a recent court sitting. Noteworthy, however, Museveni ordered the military court to deny general Sejusa his freedom, sending him instead back to Luzira for no known legal reason whatsoever. General David Sejusa is today in Luzira prison at the pleasure of Despot Yoweri Museveni, and for nothing other than pure political expedience. Museveni is a frightened man. He is keeping General David Sejusa and Dr. Kizza Besigye under locks, only because he is afraid of these powerful freedom struggle leaders freely interacting with the People of Uganda at a time when the whole country is united in demanding an immediate end to his (Museveni’s) illegal occupation of State House. The message to Museveni and his bunch of state house ‘illegals’ is very clear – The most successful People Power Revolutions are won, not by the leaders, but by the People themselves. Holding Dr Kizza Besigye and General David Sejusa hostage will not stop the People’s Revolution being actualised. 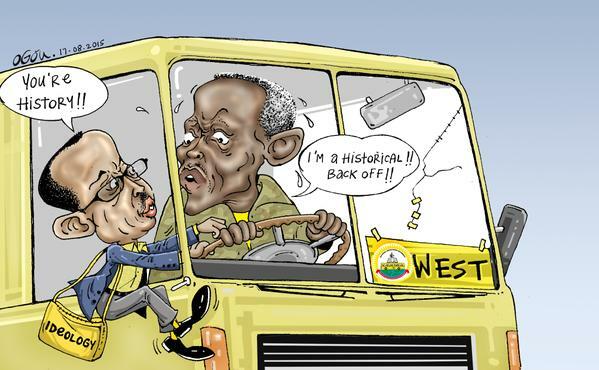 Instead, it is firing up the People’s courage and determination to resist and defy Museveni and his much-hated Musevenism like they have never done before. As General Sejusa said when he was first savagely dumped in the military dungeon at Makindye, “the People of Uganda will soon free him and the Ugandan nation” from the claws of Evildom. The experience in the General Court Martial today was yet another episode of melodrama characterising that kangaroo tribunal. I may not be in position to share all the epic events of the day for obvious reasons but I can’t help relating to you a novel legal phenomenon enunciated by the Military officers prosecuting Gen. Ssejusa. When I presented myself as a surety, the said team, together with the Judge Advocate, put up a vehement opposition, on a fallacious ground that a civilian is not legally competent to stand surely for a four star Military General! !!. That it’s only a fellow General, or army officer of a superior rank who’s competent to do that. Ironically, the chairman of the General court martial, Levy Karuhanga is a Major General. Anyway, the matter is pending a ruling that will be delivered after the presidential election. Talk of justice made in Uganda!!! Major General Matayo Kyaligonza who is part of the Ugandan Envoy to Burundi has started to speak his mind to the media. He has become critical of the way Museveni lingers in power and trying to get his son-in-law Rwabwogo to succeed him in power in country. At the same time talking about respecting him as the president he still is, but this is totally different from what other loyalist are doing in the country. A breath of fresh air, wonder how Mzee feels about this? 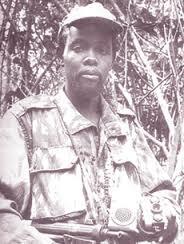 Now all of a sudden brigadier Kyaligonza from the bush-war is questioning his methods and continuation of the power in the country. “Let the president call a meeting of NRM top organs of the National Executive Council and Central Executive Committee and we discuss the matter [Sucession]” (…) “Our dear president has also made it very clear. Presidency is not like hereditary club. He should call NEC and CEC and let us discuss. We used to discuss matters in the bush really” (…) “I can defy any other person but Museveni is still the president and I respect him” (…) “the way I see it” (…) “If I meet him (Rwabwogo) somewhere and he says that I know nothing will give him a hot slap” (…) “the one who brought us here? If you want to succeed your father do you kill him in order to get your inheritance?” (…) “Youths shouldn’t think that they will start with wanting to be president. Let them start at the LC-I then we see how they behave. But when you say that the old guard are “bazeeyi”[old] and they don’t know what they are saying then we shall have problems” (…) “[Historicals] don’t want familiarity because when we came [into power] we didn’t disrespect people” (The Insider, 2015). “Who is that one? Odrek? I don’t know him, I have never even seen him,” he said. “Is he the one who gave me work? He should tell such things [about retiring] to his father in–law [Museveni]. We are the ones that brought his father-in-law in power. Don’t make me talk too much” (…) “As a matter of fact, he was the commander who took down Makindye barracks, attacking Ndeeba from Masaka road. I know that very well,” Rwabwogo said. “I give him the due respect and the honour that you give an elder. However, I stand on the shoulders of the elders in order to do something better because there is always an evening of something and a dawn of another” (…) “When I get annoyed, I really get annoyed and I say the truth. I never sugar-coat in order to make people happy. We [historicals] don’t want familiarity because when we came [into power] we didn’t disrespect people,” (…) ““Look at all those people who are attending [Col Kizza] Besigye’s rallies. They want to support a cause because they are tired” (Kiyonga & Nsubuga, 2015). I think his quotes and words speak of volume on their own. That he is asking questions in this manner also from a man who has been that loyal and becoming part of the Historicals of the NRM. He has gotten even a place in the Ugandan Envoy to Burundi as talk of dialogue there. He straightforward talking about discussion of power in the NEC and CEC proves that their questions from the loyalist even in the party. Even if the Police have gotten control over NRM Poor Youth Forum it will be harder to push on the Historicals because of their history and place in the legendary bush-war that brought the NRA which is now the NRM into power. So the President has to listen to keep things in order he can’t ambush the brigadier in the same way as the youth, even if he ask sincere questions about the succession and sole candidacy that President Museveni lives by. And it should be thought about when he is quoted and clear voice: “I never sugar-coat in order to make people happy. We don’t want familiarity because when we came [into power] we didn’t disrespect people”. That should be red light for the president! That is not GREEN! Not a go. That is what he is saying! Though I believe that the Mzee he has served all this year’s, won’t listen now and he hasn’t listened before. Brigadier can have the best intention in the world and speaking his mind about the president, but he at the same time want to show loyalty, that doesn’t mix with the general words he speaking. Though that is something we can expect, he is after all a military man who want to be frank, but also want to keep up with chain-of-command! Peace.